Excessive Smartphone Use: Do I Have an Addiction? Take a good look around; you will likely observe that most people are using a smartphone in some capacity. It is not uncommon to see that people are looking downward on their smartphone screens, mindlessly scrolling while out at restaurants, when waiting for transportation, sitting in class, at a work desk, or even while driving. According to Pew Research Center, just over three-quarters of Americans (77%) own a smartphone, with 92% of younger adults (18-29 year-olds) owning one . Digital technology, in the form of smartphones, has revolutionized the way in which we communicate, relate to others, conduct business, learn, and more. With the sharp uptick in ownership of smartphone use among various population groups, the behaviors associated with this technology are also being questioned. There comes a point where smartphone use becomes excessive, even detrimental to daily activities that contribute to a normal, healthy life. 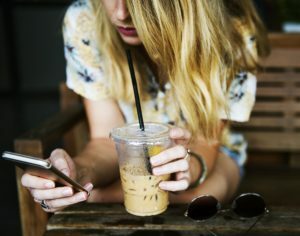 While “technology addiction” is not a formal mental diagnosis, this umbrella term is used to describe behaviors associated with the excessive smartphone usage, including texting, social media, online shopping, online gaming, and more. 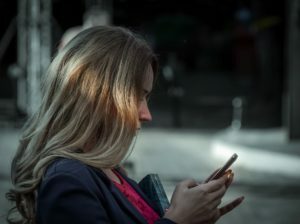 New research recently released from the Binghamton University-State University of New York has demonstrated how excessive smartphone use can lead to problematic behaviors, particularly among females, who are especially susceptible to addiction . In a survey of 182 college students, responses on smartphone usage was classified on a range, from thoughtful (minimal usage) to fanatic/addict. Twelve percent of the college students surveyed identified as “fanatics” and also exhibited problematic issues in their personal life, relationships and workplace due to a compulsive need to utilize their smartphones . Other problematic behaviors and signs identified among the students who identified as “fanatics” and “addicts” of smartphones included social isolation, impulsivity, social anxiety, low self-esteem, and depression. As technology continues to rapidly advance, excessive smartphone use can become problematic for many individuals, particularly those who may have other risk factors for addictive behaviors. The reality is that technology has dramatically changed the way in which we interact with others and deal with our emotions. Finding validation online through “likes” and “shares” has quickly become more significant than actually taking the time to interact with real human beings and engage in our relationships. Having online access through a portable device that can literally be taken everywhere also has the potential to change the way in which we feel about ourselves and others. Surveys have found that Americans look at their smartphones more than 9 billion times per day, and the time/effort involved with smartphone use is not without pros and cons . If you find yourself compulsively checking your phone or feel unable to take a break from smartphone use, it may be helpful to examine your behaviors more closely. The time that you are engaging in your smartphone might mean time that is sacrificed from important relationships, work productivity, and more. If you find yourself dealing with any of these behaviors listed above, it may be time to check in with an addiction specialist to get professional help. Many individuals may be unaware of how problematic their smartphone use has become until consequences become more detrimental, including the loss of a job, marital issues, emotional/physical health complications, and more. Don’t let the reality of your life pass you by while you’re engaging in your smartphone, and reach out for help if you are struggling with finding a balance. Published on April 28, 2017.